Futures have been drifting up all morning and the S&P 500 is currently on pace to open about 40 basis points higher. Meanwhile, the US Dollar Index is on pace for its 8th straight day of gains as there hasn’t been a down day for the greenback since the Fed’s pivot to a more dovish stance. 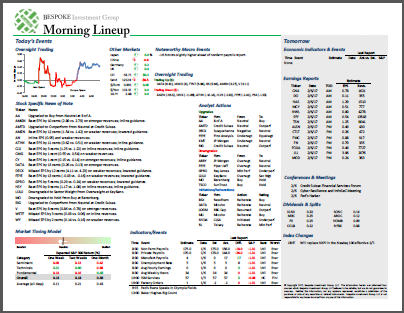 Chinese equities also returned from the New Year’s holiday with strong gains. Read all about overnight events and this morning’s news in today’s Morning Lineup. Stocks are set to open in the green this morning, but as anyone following things has no doubt noticed this year, the real action for investors has been during the last hour of trading. 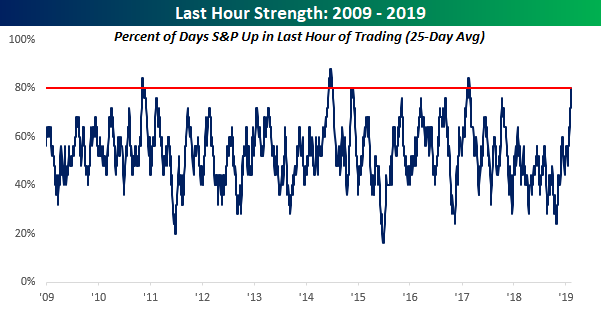 The chart below shows the rolling 25-day percentage of days where the S&P 500 was positive in the last hour of the trading day. As of Friday’s close, the percentage ticked up to 80%, which is a level not seen since early 2017. Since 2009, the 80% level is a level that has only been reached or exceeded a few times.